Pattern recognition is an evolved specialty of the human brain. This innate ability allows us to recognize faces, spot a lion in the jungle, and see objects in the clouds. Despite the effortlessness of employing this skill, it is not well understood nor can it be replicated by machines, even after decades of computer science research. So take some pride in it. 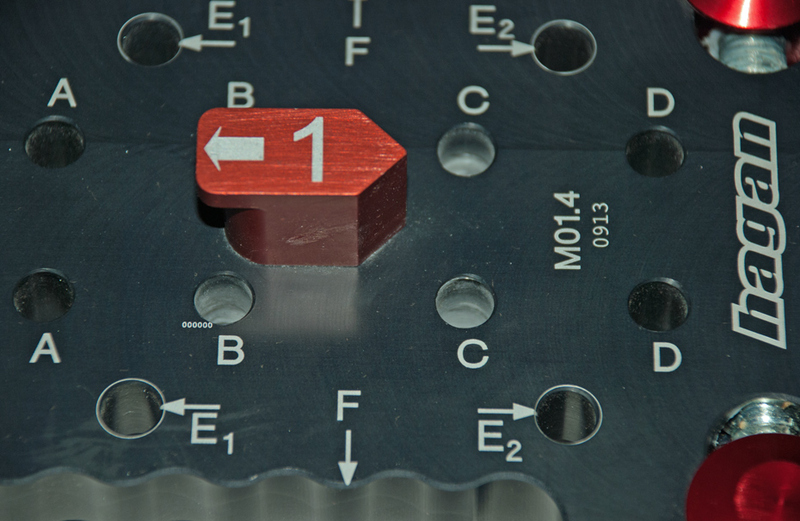 A somewhat confusing array of holes, letters, numbers, and arrows on the Hagan jig by ATK. The numbers are the distance between sets of holes in width (across the ski) and length (along the ski) in millimeters. The 3rd number on the Vertical toes is the 5th hole behind the lock lever which is also present on older TLT Speed and Comfort series bindings from Dynafit. It is located 19mm up the ski from the first set of holes. The Dynafit and Plum 32/36 widths indicate the front holes are 4mm closer together than the rear. The Superlite 2.0 34/28 width indicates the front holes are 6mm further apart than the rear. The TR-2 has a 5th heel hole 51.5mm in front of the others. Whether or not you see race bindings when you look at clouds, we can see some patterns when drilling holes in skis. Knowing something about the history of tech bindings also helps, since it becomes clear that several manufacturers have borrowed measurements from previously patented Dynafit bindings. As such, the drill hole patterns on toe pieces can be reduced to two competing standards, what we call “Classic Dynafit” 30 x 26.5mm and “Radical” 30 x 39mm. Bindings with the same patterns can be mounted in holes drilled for other bindings using the same dimensions. The astute will notice a half-millimeter discrepancy in some toe-hole lengths: 26.5 vs 27mm. Luckily, this doesn’t prevent us from reusing drill holes as binding hole diameters have seemingly standardized at 6mm, while screw thread diameters are set at 5.5mm, leaving a half-millimeter of wiggle room. However, fans of race bindings know that a half-millimeter can affect binding release characteristics, amount of heel rub in flat-on-ski mode, and degree of alignment between boot tech fittings and heel pins. And since binding screws are often countersunk, the act of tightening a screw can easily move a binding by this amount. Thus you often have to be conscious of the order in which you tighten binding screws, making sure not to tighten ones that pull in an unwanted direction first. The same half-millimeter discrepancy is apparent in drilling jigs that manufacturers provide to their dealers. 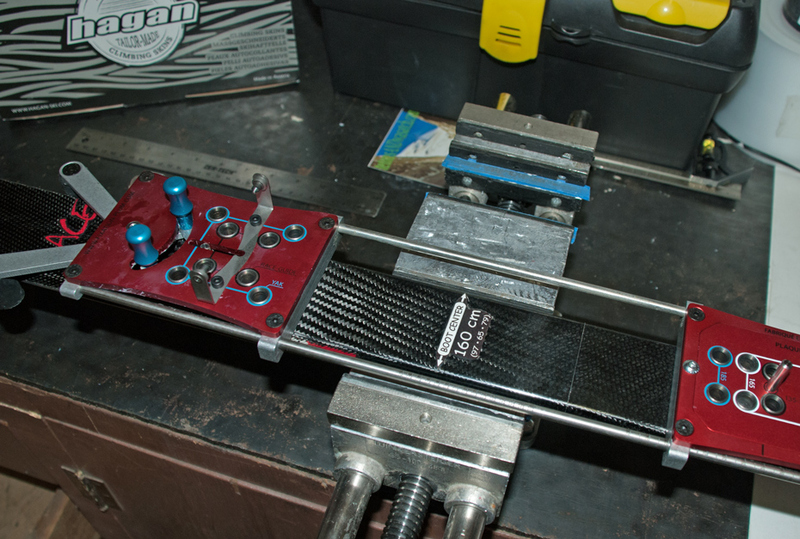 So make sure to ask your shop if they are using the correct jig, as some might be tempted to cut corners and use a common Dynafit jig to drill holes for a less common Ski Trab or Plum binding, for example. The result could be a little sloppy. The Plum jig’s combination of common and uncommon drill hole patterns. Heel hole patterns are less standardized unfortunately, but there are often solutions to compatibility issues in the form of adjustment plates. 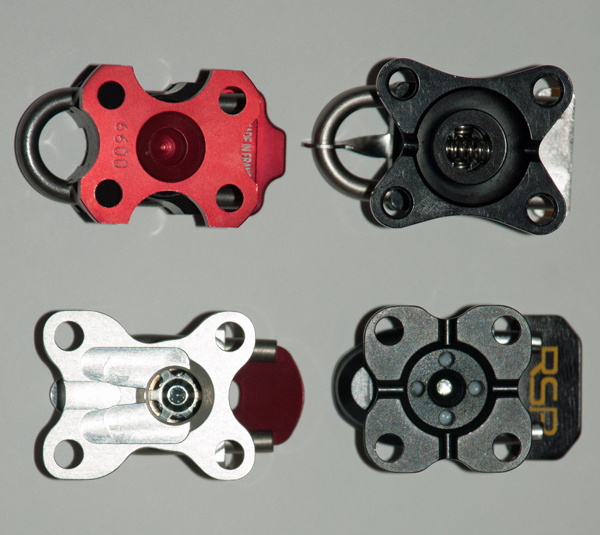 For example, a Hagan adjustment plate can be mounted with any heel that is 25mm wide, including the La Sportiva RSR and Ski Trab TR-Race bindings. The differing lengths of those bindings will affect the resulting boot sole length (BSL) range, but they will slide fore or aft just fine. 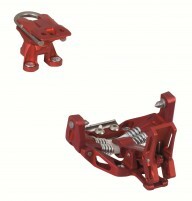 Dynafit race heels, in contrast, will only work with the Dynafit adjustment plates, as they are a unique tripod design. As you can see, there is quite a bit of variability between mounting patterns for race heels. This means the chances of being able to swap heels with another model and no adjustment plate are low. In summary, before grabbing a drill and turning your skis into Swiss cheese, take a moment to check the screw hole pattern. Similar to tech binding heel gaps, a few unwritten standards have evolved. It’s possible another binding or adjustment plate will fit into existing holes or some simple planning will give you future flexibility. That could free your brain to recognize more interesting patterns such as possible ski lines. What are the hole pattern dimensions for the Speed Radical toe piece? are they the same as the Superlite 2.0? Hi Corey, they are listed above as the 'Dynafit Radical Series'. Toe is the same as Superlite 2.0, yes. Hey Jason, I'm having trouble finding the Kreuzspitze GT pattern, is it the same as the SCTT? Hi Edward, thanks for pointing that out. It is the same pattern, I just updated the list to reflect this. so..... do I read the chart correctly in that the TLT Radical ST 2.0 would not be compatible with the Dynafit Stoke pre drilled plates that were designed to work with the Radical 1.0? Hi Paige, that is correct, the 2.0 versions have a new pattern. Will a dynafit expedition heel be compatible with the la sportiva rsr, Hagan and plum plates? (Dynafit don't seem to make one from what I gather)? Hi Kaj, it sure is! We've tried it on the Hagan plates specifically. Hi Pema, thanks for the research! This type of info isn't usually given by the manufacturers. I've just measured a Tecton with calipers and updated the table with numbers very close to yours. I wonder if it’s possible to upgrade to Dynafit TLT SpeedFit, with a pattern 28 x 38.5. Hi Deling, on a ski with a tough mounting area and a very precise mount, it may be possible. However there is not enough room based on conventional recommendations to give you the go ahead on that one. Hi Cameron, old school! Unfortunately we don't even have the measurements for that binding. Hi, I'm trying to find a tech and an alpine binding with the same drill pattern, is there such a pair? Any help apreciated. Hi Enno, unfortunately we are not aware of a crossover pattern. Do you know what the dimensions are for the hole pattern of the atk race trofeo? Hi Mark, we don't have one in stock, but it's likely the same as the Hagan ZR.